I will admit, I probably spent much too much time googling 'what to wear on a safari', as well as too much time shopping for 'safari outfits' - but I don't care! During the weeks leading up to this trip, it was all I could think about! For details on how I booked our trip, see my separate post here. a masai tribe member carrying both of our two weeks worth of luggage! 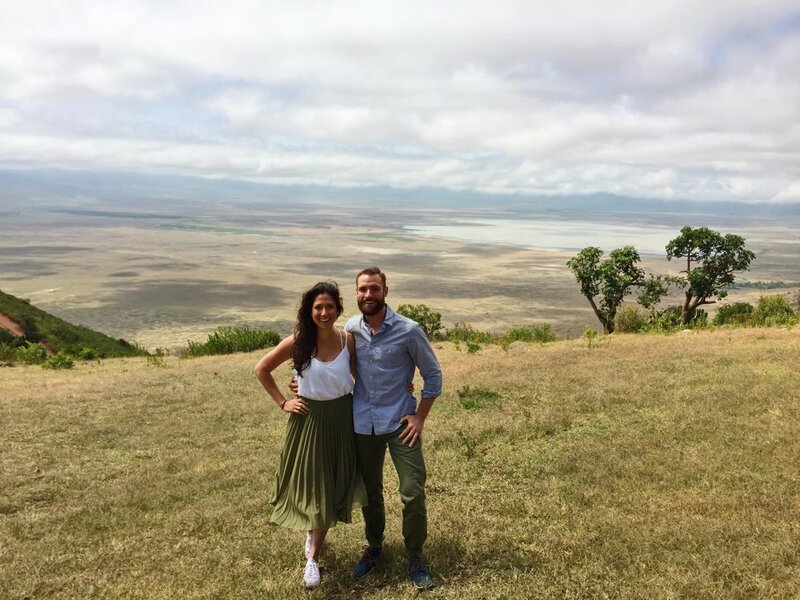 6 Days on a Safari in Tanzania, Africa. Temperature: Technically 'Wintertime'. Highs: 85ish (F) / Lows: 40ish (F). 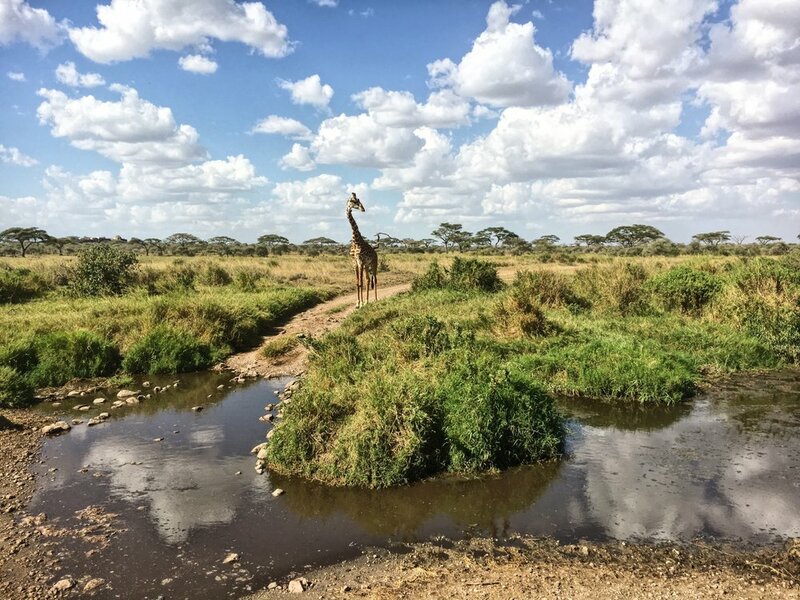 The temperature drastically changes depending on the time of day and what part of Tanzania you are in. The Serengeti = hot, dry, dusty and can get up to mid 80's. Whereas the Ngorongoro Crater is foggy, cold, damp and is about 50 degrees. Pack neutrals: tans, greens, off white, brown. You want to blend in with the background as to not scare off the animals. Layers! I didn't want to bring a 'warm' jacket with me as it would take up too much space, so i'd layer up in the morning and then de-layer as the day went on. Black or dark blue. There are these terrible little biting flies called 'tsetse' flies. They are attracted to black & blue fabric. Anything white - unless you're ok with getting it covered in a layer of dust. Temperature: The temperature in Zanzibar was perfect. Highs: 85ish (F) perfect for swimming, and crystal clear water / Lows: 75ish (F). Occasional quick rain storms. Bring some maxi dresses or longer skirts if you plan to visit the stone town or venture outside of your hotel area. Zanzibar is a muslim island, which means women should have their legs covered past their knees and their shoulders covered. 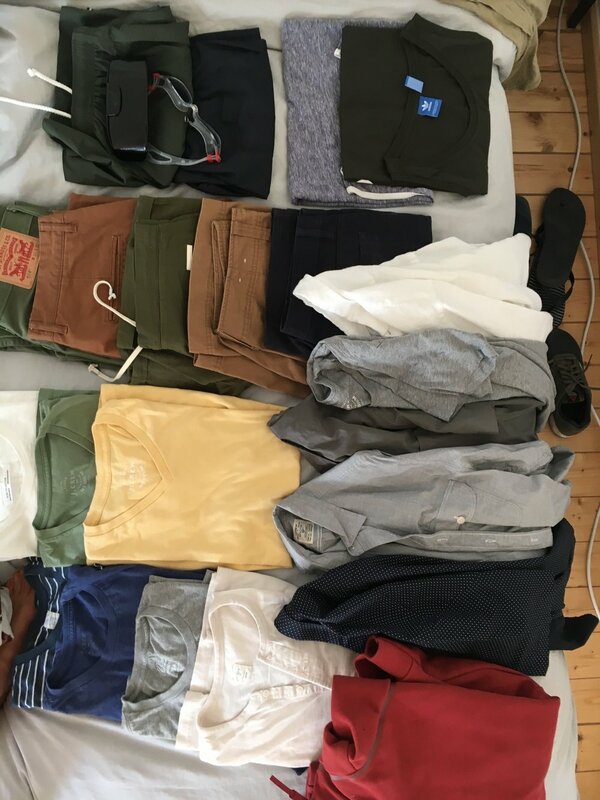 Pack less 'day clothes' as you would plan. You'll be in your bathing suit for most of the day. I'll admit, most of my wardrobe was either from H&M or asos. (I have very limited shopping options in Nuremberg, Germany!). But I was determined to still look somewhat stylish while on a Safari! 1 lightweight scarf - wore every day. 1 hat - i'll admit, I rarely wore it because it would get so windy in the Landrover. And it was a hassle to carry around for 2 weeks. 4 tank tops (1 white loose tank, 1 white cotton, 1 blush & 1 white/black stripe) - confession - I wore that same white tank 3 times! 1 light weight sweater (white) - worn every morning due to the cold. 1 black 'beach onsie/romper' - this was my favorite thing to wear over my bathing suit. You can find a similar one on asos, here. 2 pair of nice sandals - never wore them! 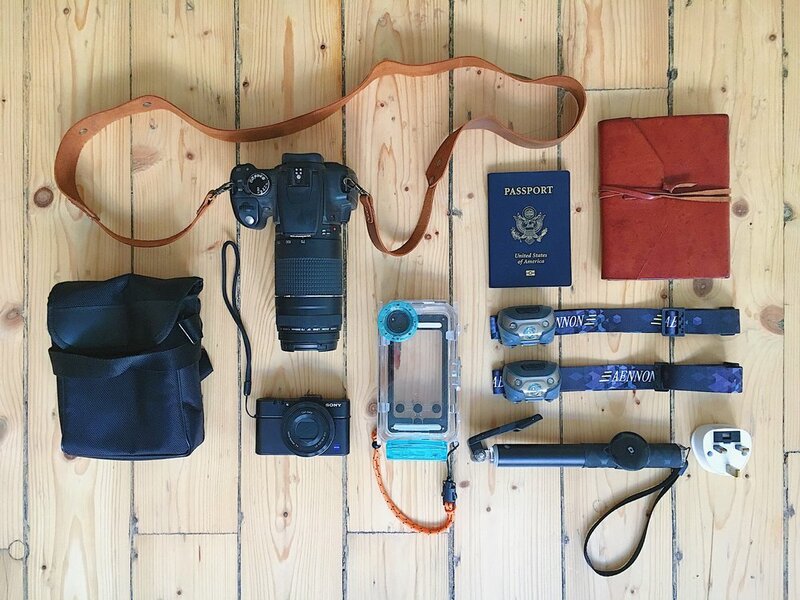 Can you believe that all fit in a carry on duffel (including the items below)? I like to think i'm an expert packer by now. ;) The secret is bringing a few favorite items that you can wear with different outfits. I had basically packed a few of each of the below in a ziplock baggie. I tried to keep everything to a minimum as to not take up space on the carryon! anti-motion sickness medication (Dramamine) - helpful on our boat ride to go snorkling. Insect repellent - We brought 4 of those small red bottles in the picture, and it was way too much. Only needed 2. A "Good" Camera with a legit zoom. I bought a new 300m lens for my Canon, and it was necessary. Smaller Digital Camera - I honestly didn't use this as my iPhone did the trick for the close up shots. Portable Charger - I bought one of these just for this trip and honestly never needed it. All the safari trucks have outlets for you to charge everything. Waterproof Casing for iphone - The one i have isn't the best as its a pain to use if you're out snorkling. But it keeps my iphone dry! GoPro - (i wished we packed) we unfortunately don't have a gopro, but if we did - this is the trip to use it on! Binoculars - highly recommend. we used it every day. Found on Amazon, here. Headlamps - I bought ours on Amazon, here. Journal - I recommend trying to write a bit each night to remember all of those amazing details! A good relaxing book - For those early nights by the campfire with a glass of wine. Does anyone else take over the entire bed packing?